The HipHopEd Conference will be hosted at Teachers College, Columbia University and include professional development workshops around racial literacy, school counseling, and STEM, as well as paper presentations that exemplify the conference’s theme. Each conference participant will be allowed to select one of the three workshops to attend. We are excited to announce Gimel Keaton aka YOUNG GURU, esteemed HipHop music producer and creator of Era of the Engineer will provide the keynote address for the conference. Finally, the HipHopEd Conference will conclude with a musical celebration of our youth. Join us for our pre-conference event. The Science Genius Final Battles presented by Heartist Productions. This year's final battles will be a production like never seen before. Science Genius Finalist from schools across New York City will battle one another for our celebrity guest judges to decide who had the best performance. Science Genius students from Jamaica will also perform showcasing their academic and scientific prowess. 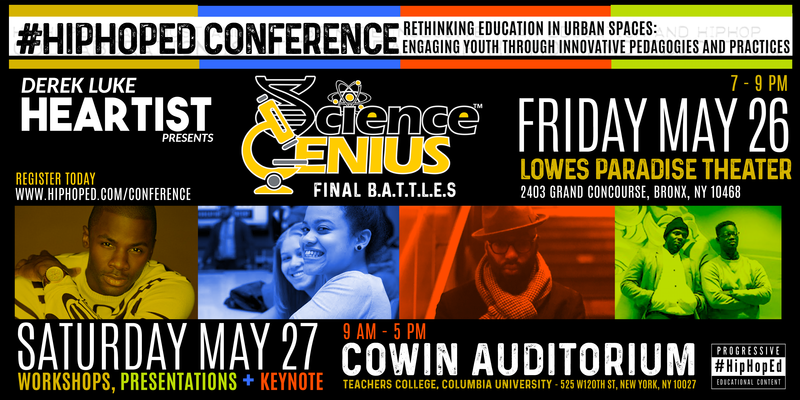 Science Genius is an initiative focused on utilizing the power of hip-hop to engage urban youth who are traditionally disengaged in science classrooms by meeting them on their cultural turf. The main activity will involve students creating science themed raps based on topics that are aligned to New York State science standards and curricula, and designed to meet both Common Core Learning Standards and criteria outlined in the current iteration of the Next Generation Science Standards. The raps that students create are part of competition within each school that will result in a selection of a winner from each school to engage in a final battle. This workshop will engage STEM educators and school leaders in the process of lyric writing around science content to model the Science Genius Curriculum. We highly suggest schools and educators that are interested in the Science Genius program to attend this workshop to gain insight on how the program is organized. This workshop will cover the use of a school counseling framework, Hip Hop and Spoken Word Therapy (HHSWT), that can be used within both counseling offices, and classroom spaces. Workshop participants will receive valuable information about the various mental health disparities that impact young people in schools, which are known to have a detrimental impact on academic performance. After discussing research and theory, participants will engage in practical application of HHSWT and draw conclusions in regards to how to best implement learned tools/strategies into their practice. On the other side of this national struggle, how will students remember the state of your classroom? This workshop calls for all educators to set their pedagogy on fire! To lean into the heat of this moment, center student voice, and allow the fire to forge another, more substantive level of engagement that is not afraid to incorporate the sociopolitical elephants in the classroom for teaching and learning. We will challenge Eurocentric pedagogical approaches that not only under-prepare students for the realities of our increasingly multiethnic, multilingual, globalized society, but are also rooted in colonial and racist ideologies that stifle the voices, identities, and realities of students of color. Using a Liberation Literacies pedagogical framework, we will ask, what does leaning into the fire look like as it plays out across the realms of personhood, politics, and pedagogy in my classroom? Participants will engage in dialogue and critical self-reflection about their current classroom climates and receive tools for rooting pedagogy in the voices and identities of students through the linguistic and cultural practices of hip-hop to set their pedagogies on fire. Register and learn more at http://hiphoped.com/conference/. HipHopEd is an organization that brings together a community of educators and scholars who challenge traditional educational systems to value the power of youth culture and voice. Originally, #HipHopEd began as an online twitter chat where educators discussed the intersections of Hip-Hop and education, but has grown into a non-profit organization that focuses on bridging the gap between theory and practice through the development and implementation of Hip-Hop based interventions in STEM, therapy, literacy and school leadership. HipHopEd is led by 2013 Hiphop Archive Fellow Dr. Christopher Emdin, Timothy Jones, Amil Cook, Dr. Edmund Adjapong, Ian Levy, and Dr. Jamila Lyiscott.